"Immigrants get the job done!" The production values of "Hamilton" as seen on stage at the Broward Center for the Performing Arts in Fort Lauderdale are none that you have ever seen before or will see again. The interrelation between the scenic design of David Korins, the lighting design by Howell Binkley, the sound design by Nevin Steiberg and the costume design of Paul Tazewell is so important that it is hard to imagine one without the other. This is all only bested by the choreography of Andy Blankenbuhler and direction by Thomas Kail that it is hard to tell where one starts and the other joins in such concise perfection that you have a feeling the nails on the fingers have to go a certain way at all times. None of this would be possible without the book, music and lyrics by Lin-Manuel Miranda who is offering a theatre experience like one you have never seen before. 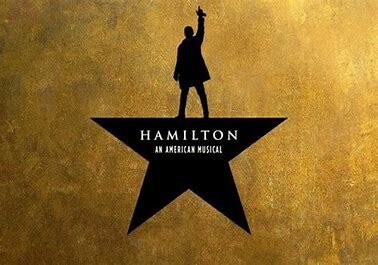 Unfairly "Hamilton" has been called a 'rap' musical and while there are rap songs Miranda has added classic musical theater songs, ballads, blues, soul along with upbeat numbers that will have you laughing. By the way the rap songs provide a lot of information in a short time moving the story along while easy to follow. With 34 songs listed the show is a sung-through experience ably conducted by Roberto Sinha with 10 musicians following his lead. Miranda's music is sung by a powerful cast none more powerful than Nik Walker as Aaron Burr. He shows a strength that almost overshadows all the other players on stage but each in their own way put forth their characters need to be there. Joseph Morales as Hamilton, Ta'rea Campbell and Shoba Narayan, as the Schuyler sisters along with Nyla Sostre interact with feelings that show the man's vulnerabilities as he tries to build a new nation. Marcus Choi brings much gravitas to his portrait of George Washington while Jon Patrick Walker offers humor as King George and Kyle Scatliffe, playing 2 much different roles, of Marquis de Lafayette and Thomas Jefferson, brings the audience as much joy as he seems to have playing them. Along with an astonishing ensemble the cast, all seemingly in constant motion, a writer couldn't ask for a better group to relate his story. Many songs are standouts and have already become a part of the musical Broadway world if not of the everyday world such as "One Last Time", "Satisfied", "My Shot", "The Room Where It Happens" and "It's Quiet Uptown". No review of "Hamilton" can ignore Lin-Manuel Miranda's use of a multi-racial cast in telling Hamilton's story in his rise as an immigrant to a man very important to the 'birth of a nation', phrase intentional, which is reflected in the audience today. At times it seems we are reliving the period, the politics, the scandals of the show taking place, in the late 1770s to the early 1800s. There are moments where Miranda uses a man's color to emphasize a point which is an important part then and now. While history is changed here and there "Hamilton" dazzles with its staging, songs and heart. "Hamilton" running tine is 2 hours and 57 minutes with a 20 minute intermission. I hope we can get tickets when it comes to OKC. Start saving your pennies--tickets are not cheap! !